They ate starch and rats, they died of exhaustion dysentery and tropical sores, but on 15 August 1945, the last year of the war, and the day that the red Japanese sun finally went down, the death railway from Pakan Baru to Muara was ready. The last nail that the scarred survivors drove into the last sleeper in the Sumatran jungle was one of copper. As tradition has it, for lack of a gold one. The railway line built by Dutch, English and Australian prisoners of war and by press-ganged Javanese slave labour (Romushas) through marshy forest of central Sumatra under orders from Japanese occupiers had taken a toll in human lives of nearly seven hundred whites and of probably more than 10,000 people altogether. And this does not include the 1,626 victims who perished on the way to Sumatra, torpedoed by the Allies on board the "Van Waerwijck" and "Junyo Mary"
No one will ever know the exact number of dead press-ganged Romushas. it is certain that the remains of thousands of these browned skinned slaves lie under the sleepers of a railway line which was never to see a train after 1945. All the suffering in this case was for nothing. The railway line no longer exists. Kilometres of rail have been looted or sold as scrap iron. And what remains is slowly rusting away in the stagnant black marsh water of the impenetrable Sumatran Jungle. When the Japanese capitulated on 15 August 1945, officially confirmed on the 2nd September, the curtain fell on the tragedy of Pakan Baru., Even in Asia the end had come at last to the most horrific war of all time. Historians were able to weigh events up, survivors to tell or record their bitter war experiences, and film makers got in on the act with their romanticised account of the "Bridge Over the River Kwai" on the famous and much-described Burma railway. All the events of those terrible war years in the Far East were researched and written up in documents and books. Almost all, for due to some mysterious reason not solved even today, there has never been an account of the gigantic drama of the 215 km death railway from Pakan Baru to Muara in the heart of tropical Sumatra, with its snakes, panthers, tigers and billions of malaria carrying mosquitoes. The suffering, the power of the Japanese and Korean guards and the fruitless death of so many simply remains engraved on the hearts of the survivors. A few still keep the notices and announcements published just after their liberation. But they are never publicised. The drama of Pakan Baru is forgotten. Even in Indonesia. Even in to-day's Pakan Baru, where children happily play on the remains of locomotives and trucks, without themselves realising at all that the rusty playthings between their campong huts are the last silent witnesses to a nightmare of suffering which was also real. For most of the POW's, who were brought via Singapore or Padang, "Mud Fun" (lit.) or Camp 1 at the edge of the Bakan Baru campong, was often the introduction to the railway. From there they were steered to other camps along the line to cut sleepers from wood, build bridges over the rivers, and to fix rails on the track. 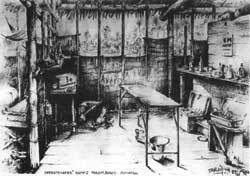 But or anyone becoming seriously ill and unable to work, the final destination was camp 2, the death camp on the Pakan Baru line, where few doctors fought using primitive equipment a generally hopeless campaign against death. One of these was military surgeon W.J. van Ramshorst from The Hague, who operated and amputated with a few simple knives and bent forks as "sharp hooks", when the tropical sores of his patients had eaten through to the bones. "We had no medicines and no antibiotics if someone had to lose a leg, the amputation made you feel a bit faint. I did have a bottle of ether, but when I had to operate on an acute ulcer one evening, in the crazy hut of bamboo poles and palm leaves, I could not use my petroleum burner for fear of explosions. Camp mates from the "work shift" stole a battery from a Japanese truck, and by the one slim ray of light from this battery I was able to help my patient. Those who did not work , ie the sick, were on half rations: 800 calories a day. The dying got nothing at all, as no-one passed them anything. But this hardly noticed amid all the other suffering. As a result we very soon had a hundred dead per month. The inmates of Camp 2 consisted of approximately 800 men. so I told a Jap: "Another 8 months and everyone will be dead". he replied: "Splendid, that's precisely the idea". Nevertheless we got through it. It was worst at night, the rats ran all over you , but once caught in a home-made trap of spring and a small board, they made a tasty meal. They had marvellous white flesh, even whiter than rabbit pieces. I saw chickens grubbing round the latrines and quickly getting fat from the maggots. And I thought: what's good for chickens is good for people too. So we fetched maggots by the bucketful out of the latrines, washed them, cooked them and gave them with sambal (sauce) to the sick, who then visibly improved because of this extra portion of protein. And in fact I made another discovery in that terrible camp, where people only actually came from the railway to die. We had no disinfectant for treating dirty tropical sores, but once again the maggots provided a solution. I wound an old sheet with maggots in it round a wound and after a few days it was nicely healed. Only peeled rice was issued, without the vitamin rich silver skins, so many died of malnutrition, beri-berri, malaria and bacillary dysentery, for which there was hardly any cure. But we were able to save a number of people with the maggots. When the surrender came at last we got a double portion of rice. All of a sudden we were allowed out of camp. I walked to a post office Pakan Baru and asked the crazy question whether I could send a telegram to my wife in Java. And, strange as it may seem, I was able to for 10 cents per word. The Japanese were extremely jumpy and when they had burnt all papers relating to the camp they asked us if we thought that they should commit suicide. Our answer was: "Yes, as your tradition hara kiiri lays down, that's the best thing you could do". In the bridge building camp we had to pile-drive trees into the river. The Japs were very careful over the tools given out. From time to time a monkey wrench would crash down into the river, and if we found it we would be given tobacco and extra food. So more and more monkey wrenches started to fall into the water, but we had tied them to a stick beforehand with very thin thread. The first train was pushed over the bridge by a hundred and fifty POWs. We never thought it would take it, for the whole thing was mainly clamped together. The train got to the other side but the ridge was distorted by the very first river flood. And then there were the tigers. The place was stiff with them. Ever since a Japanese had gone to sit on the latrine one night and had been eaten by a tiger, they were scared to death of them. Now, there was a certain Jan de Kwant in our gang, who could do a marvellous imitation of a tiger. When Jan gave a growl in the evenings, the Japs fled inside and we were able to quietly steal a chicken from the guards camp, which Jan plucked under his mosquito net, trembling the from fever because he had again caught malaria. A bridge had to erected across a wide river and our gang had to chop trees from marsh forest. When we did not jump from the path into the water ourselves, we were beaten into it. We stood shoulder deep in the water and sometimes our heads went under. The amazing thing is that nobody was eaten by crocodiles. The worst part was when a tree finally fell. You had to try and get out of the way, while a torrent of red ants rained down on you. After one to three weeks the bridge was ready and then the rain came. The river swept trees and bushes out of the jungle and we POWs had to work at night, trying to steer driftwood between the bridge piles using long sticks. But the next day there was no denying that the bridge had a bend in it. No one believed that a train would ever get over it, but the Japanese knew better. Then, when we all had to get in the very first train, I thought my last hour had come. But with a lot of whistling and creaking we made it to the other side. Because the wretched railway was easily disrupted and the clamped bridges just held together, there were many derailments. Sometimes we had to use brute force to get trucks back on the track. but I still do not know how we managed to right a heavy locomotive and get it back in place. We had to raise it using loose bits of rail and push it centimetre by centimetre. It didn't work at first, obviously, but when the swine gave the signal "Lift" and at the same moment began to beat us at random, we finally succeeded. Everything succeeded in this way by the end. Between Logas and Muara we dug our way through a hill carrying away the earth in baskets. And we laid a railway line in a narrow ravine under an overhanging mountain from which bits kept falling off.. When the first trainload of Romushas went along this line, the cliff fell in and they were all buried alive. 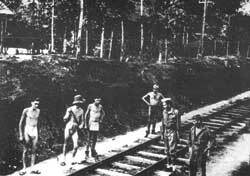 The exhausted POWs who were forced, during the Japanese occupation, to construct a railway line 215 km long right through mid-Sumatran tropical jungle, had no escape. For over a year, from late May 1944 until Japanese capitulation on 15 August l945, they were subject to the whims of their cruel Korean guards and to their Japanese masters, who had been ordered by Tokyo to construct a railway line between Pakan Baru and Muara at the cost of so many human lives. They acquitted themselves very well in this task. More than ten thousand native slave labourers and nearly seven hundred whites, mostly Dutch POWs died in the torrid Sumatran jungle of malnutrition, beri-beri, tropical sores, malaria and dysentery.